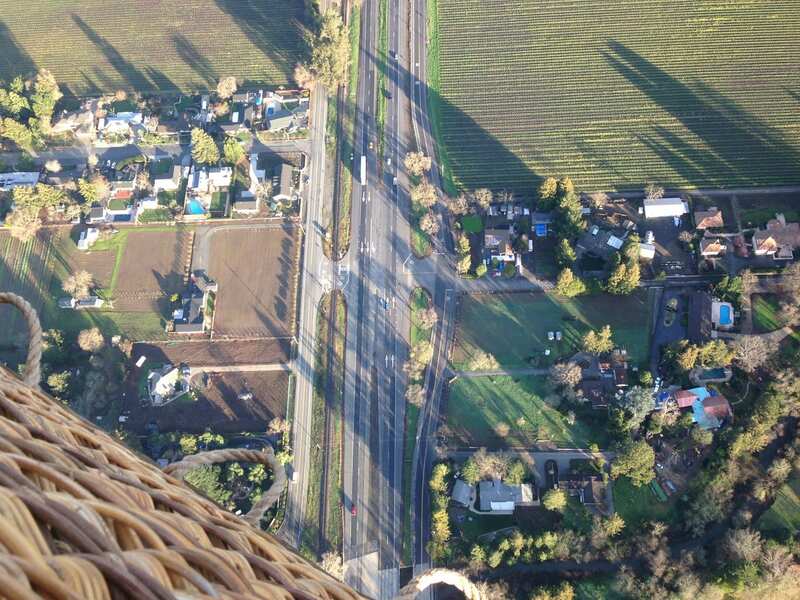 I try booking a hot air balloon ride with Balloons above the Valley on the day after I land in San Francisco. I’m here for work but I want to make the most of the weekend and, aside from an unlimited line-up of wine tastings this seems like a great new perspective on the valley. Unfortunately, the weather betrays me and strong winds, rain and fog cancel my trip. But I have already had a taste for it: I’ve watched YouTube videos, read reviews and seen photos so now, as if on a childish tantrum, I must go on it! I have one more week in the area and every day I ponder between doing the crazy thing and driving there at 4,30am or sleeping in. The reality is that I have meetings scheduled every morning so the decision is pretty easy. Until Friday, when my morning is free and I finally see an opportunity. At 4pm on Thursday I email the lady I’ve been in touch with and I confirm my joining, at the last minute, and in the spontaneous impulsive way I am known for. I have work to do so I can’t really go to bed that early but I try to make it to bed at 11pm so that I can at least have 5-6h sleep. The alarm rings too many hours before dawn. I rub my eyes and curse my travel addiction. I shower, pack the last items out and head out to my car. Thankfully, I checked out the night before and bought a kitkat for the journey which now tastes like heaven. Google Maps says 1h 30min, no less, so I better get going. I make it to the Marriott Napa Hotel where the group is meeting and head straight for the pastries and coffee. It’s best I get those before anyone talks to me. I am a morning person and not usually grumpy at the wee hours of the day but this is a test to anyone’s friendliness. It’s not even 7am and I have been awake for over 2 hours already. The reality is that we don’t leave the hotel until past 7,30am so I am quite unhappy there is so much waiting around when nothing seems to be happening while I had to wake up well before 5am. I guess it is the price to pay for group adventures. The group waits around, devours pastries, drinks coffee on endless refills and signs indemnity forms. I am paraphrasing but you get the gist. This is a relatively safe activity but, at the same time, the balloons can’t be controlled, they simply go with the wind. Pilots can control altitude only by heating the air inside the balloon or, I imagine, by dropping passengers overboard. The rest is left to fate and nature. Finally, after everyone is signed up and fed there’s one last thing: restroom visits and smoke breaks for those who need it and we are good to go. We jump into vans and drive to the take-off locations. My driver and hospitality representative Phoebe is new, has just moved here following a passion for balloons and is very sweet and caring, almost like an older sister. We arrive to our positions. There are two balloons right next to each other and the pilots are already in their baskets pumping up fuel to keep the balloon up and filled with hot air. Apparently we are late so we are rushed in the baskets. We climb up the sides where there are a few holes where you can put your feet and a couple of ropes in which to hold yourself. I want to take a selfie, or rather, a few, but I am rushed. Later on I figure they just wanted to sell me a photo because we still wait for a few more minutes before lifting up and one of the staff members comes around the basket to take our picture. Back on the basket we finally are given the go signal and we are released. 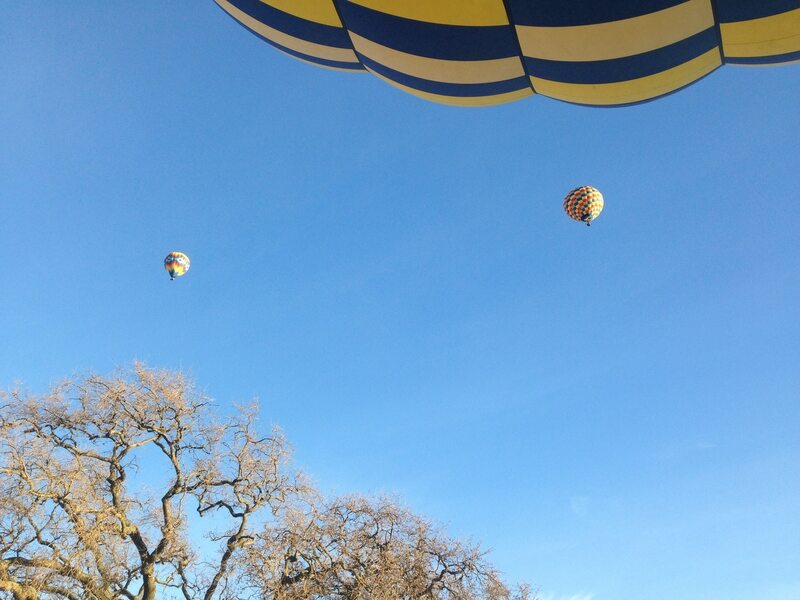 The balloon slowly lifts up and soars above the Valley. It is remarkably still and slow, peacefully gaining altitude. I did not expect it to be so quiet and gentle. Although I am not sure what my expectations were. 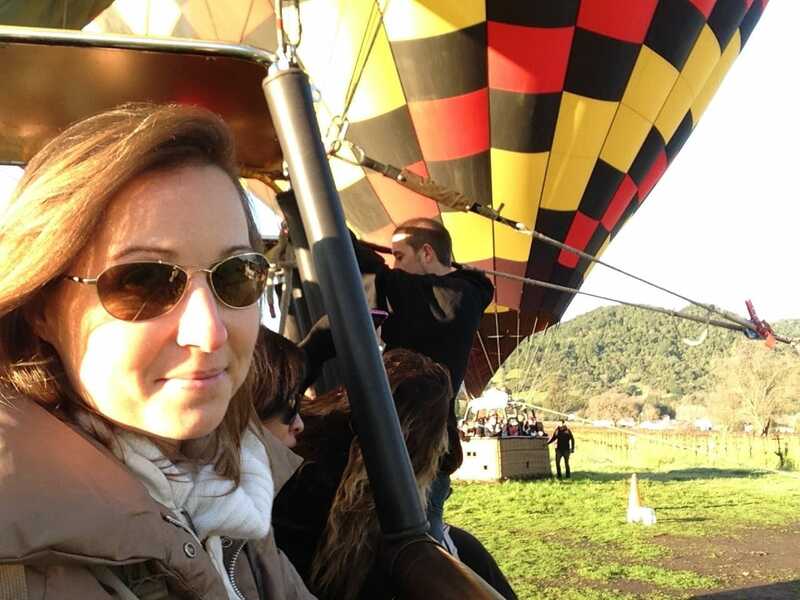 This was my first hot air balloon experience but I am already booked on the next one in Bagan, Myanmar, in 2 months! The journey is beautiful and provides an entirely new perspective on the area. Having spent the previous weekend touring around from the ground and, I must admit, in terrible weather conditions, this was a fantastic way to counter those memories. I am sure if this was intended or not but I had assumed we were going to see the sun rise from the sky or that, at least, the sun would be coming up as we would soar. The reality is that, either because we were late or because it is not meant to be like that, we took off well after sun rise, a good one full hour, so the sun was still low, providing the warmth to the photos, but it was also too bright and blinding. After getting up so early I would have loved to see the sun come up properly. My pilot for the day is Jake. He is pretty young, can’t be too many years over 20 and we are told he got his balloon pilot license before he got his driving one, living and breathing hot air balloons all his life. You can tell he is at complete ease and as if he was at home watching TV. He is extremely calm and mature for his age and very well versed on the history of the area, the stories and the flying of balloons. He tells us he is pretty shy but keeps chatting along and answering anyone’s questions all the while. I am standing farthest from him so at times I drift off be it because I am caught in the moment or because I am snapping away tens of photographs. The basket is pretty big but just enough to hold all 24 of us. They are designed with 4 compartments in mind, think a basket split into 4 sections each containing 6 people standing one in front of the other in pairs. I am by myself so I can just stand at the edge of one of the compartments. If there were two of me we would be literally standing like sardines in a can, right in front of each other the taller one behind and facing out into the horizon and the view below. I struggle to kneel down to grab things from my bag which lies on the floor because there isn’t enough space for me to bend my legs or bend down so you get an idea for how small the space is. That being said, we are there for about an hour and you are looking out at the views almost all of it so you forget about the lack of space. I am pretty sure this also helps with safety as it is pretty hard to jump or fall off! Jakes keeps pumping fuel into the balloon now and again and when he does that the heat from the burning is so intense that I have to look away and cover my head. They do warn bald people to wear hats and I can vouch for that, having such fine hair I struggled and I was not under the flames! Suddenly, half way through the flight, I realize that I am not scared and that actually, fear has not even crossed my mind. I also realize that I have not looked straight down once. I do that and I have a mix of awe and vertigo running through my spine. The houses, fields and vineyards below us are close enough for us to tell the details but far enough to guarantee a sure death. I decide it is best I don’t do that again, although I do snap one more shot. I can’t help it. As my shutter keeps beeping with every shot I notice I am the only one in the group that brought a camera, everyone else is simply using their phones. Half of me gets reminded that I am a travel blogger after all but the other half feels sorry for all of them because the view, the scenery and the perspective cannot be captured on a phone, you need a wide angle and a good camera to fully grasp the beauty and depth of the moment. I spend the whole hour trying to do that, but can’t help to feel that I failed, wish the photos could show the depth of the view I had from up above. So, what about the view? Jake tells us that San Francisco Bay which we can see in the distance (sadly the depth in the photos here does not show the reality) is only visible 9-10 days a year, and today is one of them! I feel privileged, we have been extremely lucky with the weather, it is a beautifully crisp winter morning with clear skies and the Bay in the distance covered with the usual fog the area is known for. I feel lucky and glad that I did not take the trip the weekend before in suboptimal conditions. The timings do vary with the seasons so sometimes the meeting time could be earlier or later than my 6,45am. But, if you want my honest advise (don’t tell the organizers) you can arrive easily 20min late that and cause no issue, nobody will even notice as they will be busy checking everyone in. To make it even better, stay at the Marriott the night before so you just need to roll out of bed and down into the lobby. They advise to wear layers and I can testify to that. 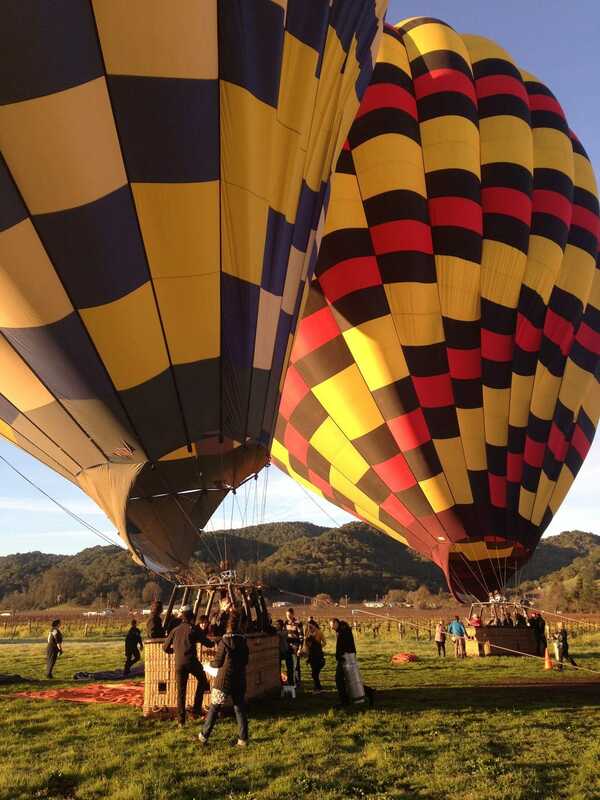 It will be chilly in the morning but as the day progresses and you are under the burning flame of the balloon it will get warm and even hot in the summer months so it’s best to be able to take layers out. The team also tells us that it is much warmer up there and down on the ground and they are right. Remember the flame? That’s right, it produces a lot of heat so remember to wear a hat. If like me you want to take camera shots put all the lenses and accessories you need in your pockets, you won’t be able to easily bend down to get stuff out off your bag. Stay for brunch. I unfortunately had to go back, to work! But if you can, stay for brunch afterwards. They set up a pleasant brunch outdoors under some umbrellas and the spread did look yummy. If you are going to wake up that early you deserve a treat. And for the $209 dollars I paid it is pretty good value once you add the Mimosas you can have. 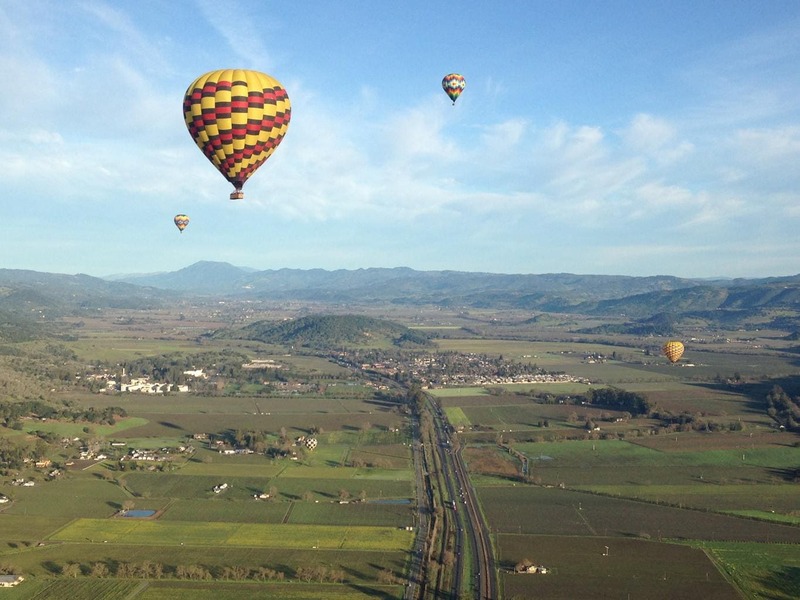 Here are some other alternative things to do in Napa Valley other than wine tasting.